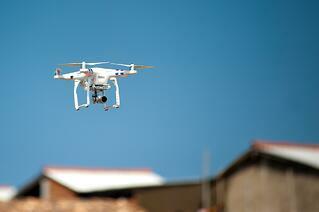 Have you noticed the increase in drone traffic recently? A recent report by the Federal Aviation Administration (FAA) estimated that 2.5 million drones would be purchased last year, and the numbers are only rising. In March 2017, the FAA stated that 770,000 drones had been registered in the previous 15 months. In response, the FAA is now launching a new Aviation Rulemaking Committee to create standards for identifying and tracking unmanned aircraft. Unfortunately, it’s not only your neighborhood hobbyist who’s finding uses for drones either, as criminals and terrorists are not surprisingly pushing the boundaries of what’s possible with drone technology. Businesses should be aware that drone use is not just restricted to drug dealers and terrorists, however. Drone technology is providing a huge boost to corporate spies looking use them for wifi hacking, surreptitious audio recording, video recording, or IR imaging (nightvision). This report by NBC shows the ease of which wifi hacking tools and recording devices can be mounted on cheap, off-the-shelf drones available in electronics stores everywhere, which can then be used to take “wardriving” or “warwalking” to a whole new level. In one amazing demonstration, researchers even showed how wifi imaging could be used to create an internal map of a building using nothing more than two drones with wifi transceivers. So, what can be done about this? First, businesses should re-evaluate the susceptibility of their physical locations to attacks using radio frequency (RF) technology. Whether wifi hacking, TEMPEST, or even wifi imaging, the use of RF attenuating window films (i.e., films that block RF energy from the outside) can be very powerful. For exterior walls and roofs, there are RF shielding foils, fabrics, and paints that can help insulate your business from RF attack, by drones or otherwise. Where the potential for physical drone attacks using explosives is an issue, there are Forced Entry Ballistic Rated (FEBR) glass solutions and blast resistant laminates that can make a big difference to your physical security. Numerous businesses have sprouted to provide drone protection and analysis, although local jurisdictional and federal laws dictate the extent of defensive actions allowed against drones. Whatever your concerns, questions, or needs are for protecting your business from intrusion by drones, reach out to the professionals at Signals Defense in Owings Mill, Maryland for assistance. The company has been working with the U.S. intelligence community for years and increasingly provides the same protections to businesses that need it. If you'd like to know more about how we can help you and your business, please click below.